AMD is looking to bolster its already impressive sub-£200 range with a half-and-half card. Created using the best of both the first and second tiers of its latest Southern Islands range, the HD 7870 XT is using the top-end Tahiti GPU, albeit a cut-down version. The fact that it can fit all that in a card for less than two ton seems impressive, but we’ve seen what damage can be down when you start slicing up your top-GPU with Nvidia’s convoluted lineup, so is it a cut too far? These are tough times for AMD, the computing industry’s favourite plucky little underdog. With share prices at a low ebb and a dwindling pot of ready cash, there are reports that the company may not be around in its current form for very much longer. That’s a terrible thought for the industry, because lack of competition breeds complacency and a general lack of innovation. Just look at how much Intel has sat on its laurels since it retook the CPU performance lead. When it had been talking up core count over frequency increases, we’d hoped to have six and eight-core desktop processors by now. Instead we’ve had to make do with overpriced server chips squeezed into a bloated server/desktop platform. Sadly, AMD has been making a rod for its own back. Despite having the best graphics cards of this generation, in terms of price/performance metrics, AMD is still ceding market share to Nvidia’s GTX lineup. The public perception of flaky drivers and weak performance may no longer be true, but the extra marketing muscle behind Nvidia means it can still keep ahead in the game. Giving its partners these cheaper, slightly cut-down Tahiti GPUs to make the HD 7870 XT (there are no reference versions) should help. They may simply be chips that failed to make that grade as Tahiti Pro or Tahiti XT GPUs for the HD 79XX range, but they are perfectly happy running with a few cores lopped off. Dropping them into lower-caste SKUs is almost money for nothing. The fact AMD is just shipping out the chips to partners rather than making any reference cards means it’s just getting straight cash for the silicon itself. 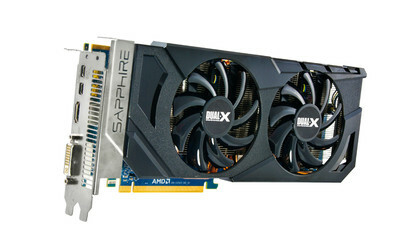 The combination of impressive price and top-tier performance ought to mean that its partners ship a shedload of these cards and they deserve to, because the Sapphire HD 7870 XT I’ve been playing with is an excellent little card. What’s actually in it then? That chopped-down Tahiti LE GPU is essentially the same chip we’ve seen in the HD 79XX series cards, and is running at the same speed the original HD 7970 debuted at before the GHz Edition landed. The difference is that AMD has shut down a chunk of the silicon, so it’s running 1,536 shaders compared to the 2,048 and 1,792 cores of the HD 7970 and HD 7950. There are fewer Texture Units too, and Sapphire has chosen to pair up the standard HD 7870 memory back-end with the Tahiti LE GPU. That means you have 2GB GDDR5 running at 6GHz on a 256-bit bus. That’s the same as you get with Nvidia’s top-end graphics lineup, so we wouldn’t worry unnecessarily about losing out on the video memory. In terms of performance, there’s nothing under the £300 price tag of the GTX 670 that we’d recommend over this impressive little card. 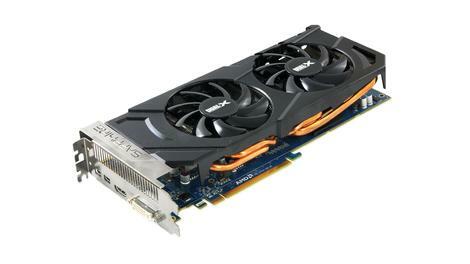 The GTX 660 Ti is now looking even more sluggish, and even the HD 7950 is suddenly really struggling to justify itself. Sure, the slightly higher spec Radeon is faster, but only by a few frames in our benchmarks. We’d also put this Sapphire card up against an overclocked HD 7870 that’s retailing for the same price and it’s considerably faster across the board, even in the HD 7870 XT’s stock settings. Sapphire’s usual excellent cooling does a great job of keeping both the chunky GPU (it’s getting on close to twice the physical size of the Pitcairn silicon) running cool and keeping the entire card running quietly too. I’ve got thermal paste running through my veins, so that means just one thing to me: I can overclock the hell out of this chip. From the starting point of 925MHz I was able to quickly and easily push the card up to a stable 1,200MHz. I’m pretty sure it could go further with a little more overclocking love, but it was still relatively quiet compared to the AMD reference cooler, and delivered HD 7950-beating performance figures. The fact that for less than £200 you can pick up a graphics card that runs most contemporary games at very playable frame rates – with all the DirectX 11 post-processing cake you can eat – at the ludicrous 30-inch resolution of 2,560 x 1,600 is incredible. There’s now such a huge amount of graphical horsepower available to PC gamers for comparatively little that we’d struggle to justify spending more than £200 on a graphics card. With the new generation of graphics cards just around the corner, it makes sense for AMD to try to shift the left-over silicon it has cluttering up its warehouses. But it’s surely going to mean the remaining HD 7950s and HD 7970s will just be left on the shelves as the HD 7870 XT takes up the slack. It’s also indicative of the trouble AMD finds itself in that it’s had to fight so hard on the price front with this generation. You don’t see Nvidia making the same price slashes, because it simply doesn’t have to. Nvidia’s market share has gone up, and it’s selling more GTX hardware than it was expecting to over the last year. So long as AMD finds a way to stay solvent, this is all good news for the consumer. We’re getting fantastic graphics tech for relatively little, and if the reports on the next generation hardware are to be believed, we won’t see much of a jump with the HD 8000 or GTX 700 series. For now then, and possibly for the next year or so, this is all the graphics card most of us are going to need. AMD’s loss is our, and Sapphire’s, gain.